--Do you ever wonder why people collect things? --How did 15th century private desires to own collections lead to the museum as we know it today? --Why is Florence, Italy, considered one of the birthplaces of the modern museum? --Find out this summer in Museum Origins! June 10- August 3: An 8-week course that blends online learning with onsite investigation (in ITALY!) and scholarly research. Great for students in art, art history, literature, history, public history, anthropology, psychology, museum studies, library & information science, classics - all majors welcome! First three weeks: Course readings and discussions online. Last three weeks: You write a research paper. After the course: An experience that lasts a lifetime. APPLY NOW! Applications are due April 1! NOW ACCEPTING UPPER-DIVISION UNDERGRADUATES FROM ANY INSTITUTION, ANY MAJOR! While the collecting of objects can be found as far back as ancient times in various parts of the world, the birth of the modern museum finds its roots in Europe, especially in Italy. In the context of today’s world, students will “go back in time” to understand the origins of Western museums and the meaning of publicly shared collections through a series of competing dualisms in knowledge creation and organization. Students will explore the history of the modern museum and spend two weeks visiting actual sites and collections that played a role in this history. Exploring the past in this way is geared specifically to help today’s museum workers gain a better understanding of their own role and purpose in their community, society and nation. This course is part of a Museum Studies specialization within the Master of Library and Information Science degree at Kent State School of Library and Information Science. Museums, like libraries, are in the information business. The museum studies courses at Kent State employ a holistic approach to the study of museums as institutions that generate and perpetuate knowledge. Students will gain an understanding of museums in context as dynamic, interactive information systems composed of people, objects, and activities. Because the SLIS courses are structured within a library and information science framework, students are able to cut across the spectrum of traditional academic disciplines, which strengthens the skills of future museum professional by giving them a broader perspective, a larger knowledge base, and more flexibility. Students in the Museum Origins class do not need to be in the M.L.I.S. program, but should understand this unique approach to the discipline of museum studies. 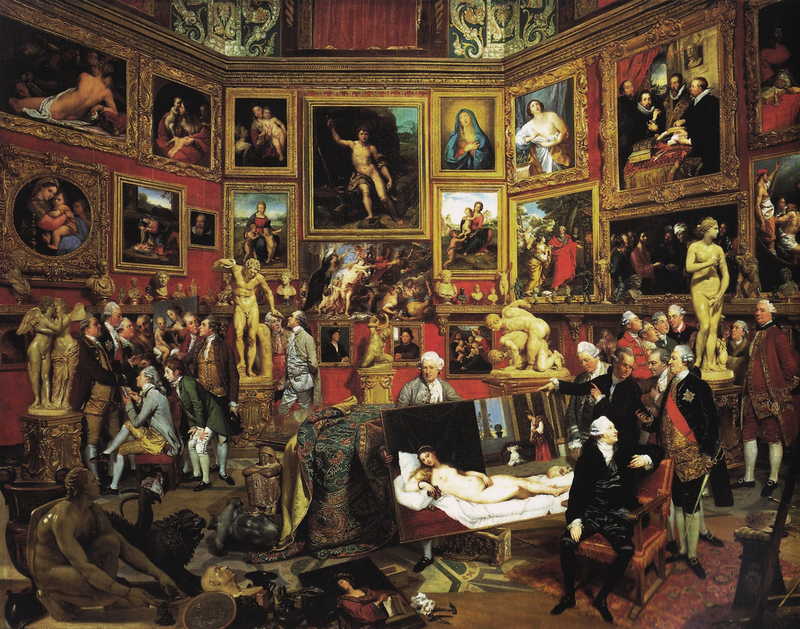 Image: "The Tribuna degli Uffizi," Johann Zoffany, 1772-1779; found here. Click in image to see larger, more detailed version.